Disclaimer: Because of a concussion, I am not a hundred percent clear on all the details of these events and the order in which they occurred. Much of the weekend is still a little hazy. “Blessing” is the only word I have at this point to explain the week. Wednesday began with my red Dodge Dakota blowing up. I had spent the morning trying to fix it without success. I needed to be down at Riverside Rodeo Bible Camp in Nevada, Missouri by noon. I had my truck towed to the mechanic, came home and rested my head in my hands. After the last few months of busyness and worry, I came to the point of breaking. I threw my phone down and took off on my bike to the north, without a word to my wife. I put word of it on Facebook and within minutes had texts from so many friends aound the area with words of encouragement and offers of help. People who had After disappearing for a few hours, she became worried about me. It was a bad decision on my part; a selfish and cowardly decision. But I have people who care deeply about me. Men like Danny Schnelle, Tim and Ethan Schultz, and my Dad who scoured the county for me. Despite my stupid decision to run away from my problems, I am blessed to have men in my life who deeply care about me. Thursday morning, I got the damage on the Dakota…$1500 for a truck worth $600. Begrudingly, we headed down to Nevada. I was worried about transportation, the rest of summer, and about 100 other things, not one of which was Rodeo Bible Camp. I was mad at God, mad at life, and mad at the situation. When you are mad at God, the last place you want to be is Rodeo Bible Camp. We headed there anyway in 2 hours of silence. The moment we showed up, our extended family welcomed us, with open arms, despite our 24-hour-tardiness. I was reluctant to go, but it was amazing how my Spirit was immediately lifted by the likes of Pastor Roger, Josh, Lucas, Tyler, Seth, Nate, Kip, Jud, Brian, and Ben. For a week, I was given the opportunity to talk with them about life and the struggles that I have had recently. We talked about God and His work in our lives. They took the time to ask about me, my marriage, and ministry. They loved me despite my ugliness and my struggles. I am blessed to have people in my life to lead me, to disciple me, to pour into me, and to disciple me. When Riverside Cowboy Church heard about the problems I had with my truck, they immediately hit their knees in prayer. They lifted up Tricia and I, our situation, and the ministry of the word. They felt called to provide for our need. On Friday afternoon, they gave me keys to a 98 Dodge Ram pickup…a nicer vehicle than we could ever afford; an example of the Church being more gracious, generous, and caring than it ever needed to be. And just like this Church has always done, no one seems to know who is really responsible for purchasing the truck. Everyone seems to be in the dark as to how it appeared at the camp ground’s Friday. A bull had just knocked me so I am a little fuzzy on that part too. But I do know that I am blessed to have people care about the work that Tricia and I do on the road and blessed with a better group of people than I deserve. Ethan and I in the new ride made it back to Topeka. We pulled in with the bulls loaded. 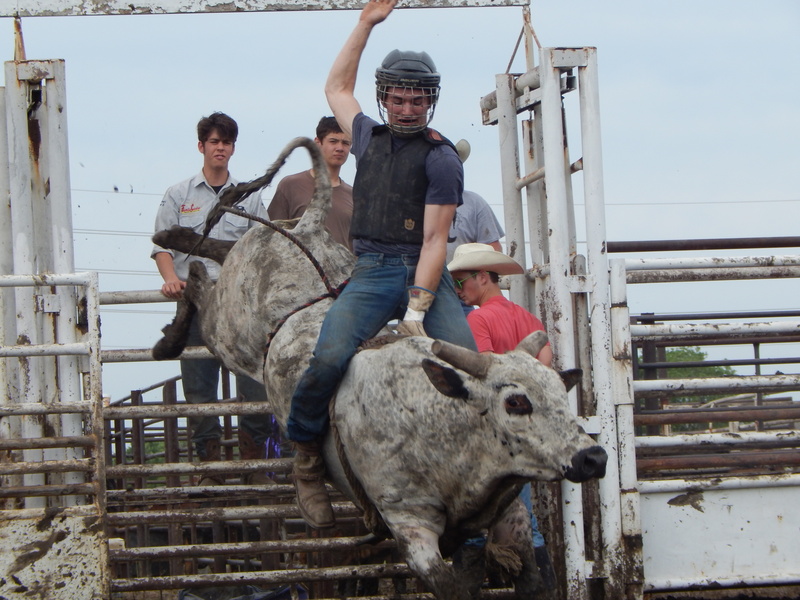 In 6 inchs of mud, a pair of jeans, and a soaked vest, I got to fight a few bulls with Tyler Dees and Daniel Unruh. Both are men that I have been extremely blessed to talk with and learn from. After the Rodeo, the rodeo small group, Brylen, Brandon, Brody, Blain, and Ethan, headed up to Buzzards pizza where Brad McCarter joined us, another man greatly appreciated in my life. We talked about life, being men, and rodeo…three of my favorite topics. As we were leaving the pizza joint, Brad and Daniel, informed me that they were going to change my wifes’ brakes after the rodeo Sunday. I am blessed to have men who are handier than I am as part of my life. Chad Chambers had asked me to preach at Cowboy Church on Sunday morning. I was able to talk about God’s love for us and how He showed it on the Cross. Shanie and Kassie spoke about their dad and how to rodeo family had supported them over the last year. Brian is another man who has greatly blessed me in the past. Then I shot baskets with Brandt McGee after Church, another man who’s on the list. As I thought back to Church service, I am blessed by men who lead their families in the arena and out. So after a 5-hour perf on Sunday, Brad cooked us some hotdogs as Daniel and Him changed the brakes on my wifes car. I sat in silence, partly because I was out of my element, and partly because I learned the same lesson that I had been learning the last week or so: I am blessed beyond what I deserve. I know these things. But when things come down to it, I rely on myself. I do things my way. Isolated. Alone. I didn’t want anyone’s help and didn’t need it. But I did. I forgot that God has given a community to be His hands and feet. I had forgotten that Christ not only died for me individually, but his people collectively. These men and women take care of us at our darkest moments. It’s the Bride of Christ acting and loving like its Husband. And for that I am forever thankful. 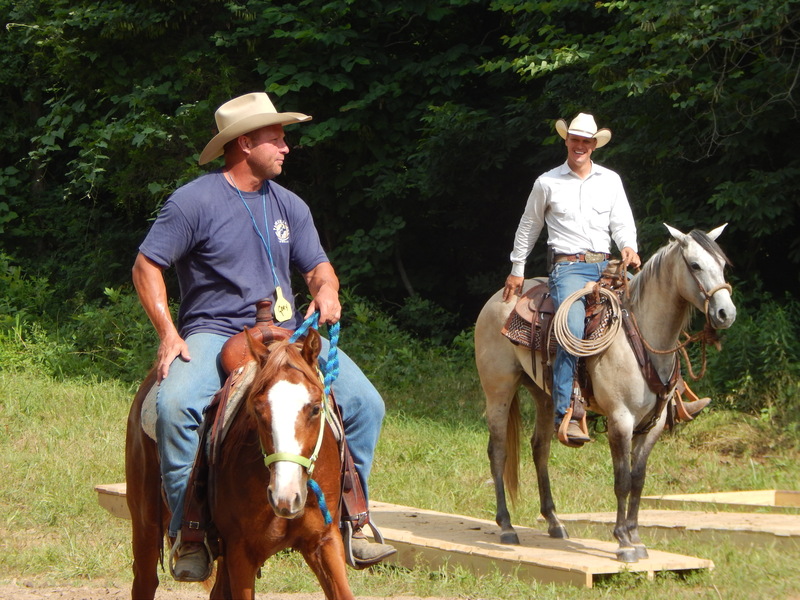 Conversations are the fun part of the job and Spoon Creek Rodeo Bible Camp was a lot of fun. I remember taking his advice and trying it out on the girl behind me in Acts class. I don’t remember her name, but I do remember a glare from Mark Moore. 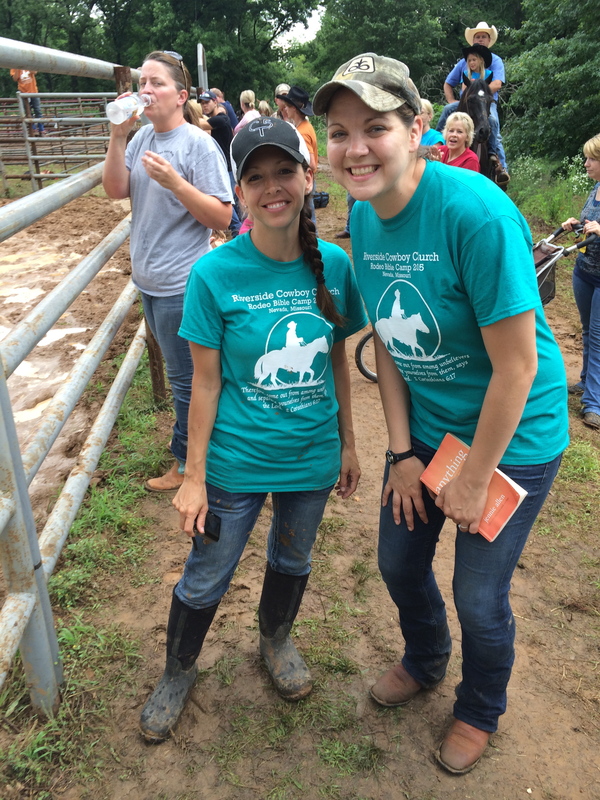 Spoon Creek Rodeo Bible camp was a chance for me to again practice asking questions. It’s easier to do when the people around you are interesting. Every Rodeo Bible Camp that I am a part of has a different feeling to it. Gardener is full of people that are just like me: same stage of life, same struggles, same experiences. We sat around at night and talked ministry: how to find your “sweet spot in ministry”, when ministries need to change direction, how much should ministry use culture?. We talked about how to better serve our wives, to honor them more, and how to avoid sin. We discussed the future and dreams. We ate cake….alot of cake. I got to know a junior in high school and his awesome family. He sprained his wrist in the bull riding and I took him to the hospital. We talked school, trucks, and girls… not in that order. I got to talk horse-shoin, bull riding, and how sometimes kids get overlooked because of their circumstances. I got to see the hearts of the leaders as the talked with their students. I got to see the passions of the leaders when rodeo and scripture collided. When Scott Brooks talked about a great save made by our bullfighting student, it was hard to tell wheter he was crying because of joy or laughing so hard the tears had to go somewhere…but he ended it with scripture. Pages of the Bible were worn out as we discussed Scripture. Looking at the ministry of Jesus, particularly in the book of John, conversations were a central part of his ministry. Lives were changed because of words exchanged. I know this: my life was changed and I met Jesus, during conversations that were had during that week. Great conversations were had in the horse barn, the passenger seats of gators, at lunch, at Sonic, in the back pens, and during instruction. I talked with some of the most passionate men I know (Scott Brooks), some of the most talented (Caleb and Thomas), some of the most gifted Rodeo hands (Daniel Unruh, Tyler Forell, Little “D”, Vincent Oulette, and James) and some of the most consistent and revered (Ed Oulette, Terry Newell, Dave Head, Scott Petish, Bob Hennessy, and Brian Barrett), and do ministry with people who think like I do (Brent Noe, Thomas Benton, Bandy Brooks and Chad Chambers)…when it comes down to you couldn’t have asked for a better week.